Be yourself and enjoy making more great memories, without worrying about developing pigmented spots. *Brightening cosmetic products suppress the generation of melanin and prevent pigmented spots and freckles. This is the collection of items developed with science to prevent pigmented spots. The following explains the brightening approach of the items and ways to use them effectively. 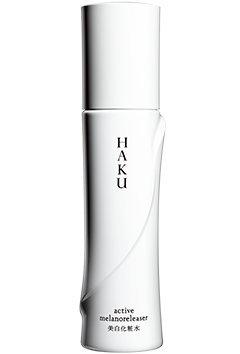 The ultimate HAKU developed through over 100 years' skin research and advanced concept of pigmented spot prevention. Our unprecedented brightening products act on the root causes of pigmented spot formation under the skin, and suppress the sequence of melanin generation to promote clear, dewy skin with a rejuvenated and translucent appearance. Apply twice daily, in the morning and evening. 1. Prepare the skin with face lotion before dispensing a dose of the product onto your hand. 2. Apply it to five points on your face: both cheeks, the forehead, the nose and the chin. Massage it thoroughly over the entire face. Subsequently, apply other products to condition the skin, such as emulsion. In the morning, it is a good idea to also apply sunscreen on top. 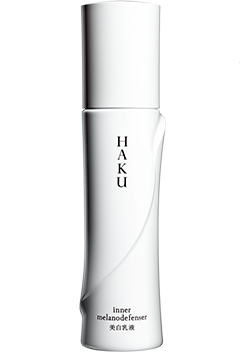 Formulated with Anti-Melano Agent developed in 2011 for the first time in Japan by successfully combining 2 types of active brightening ingredients. 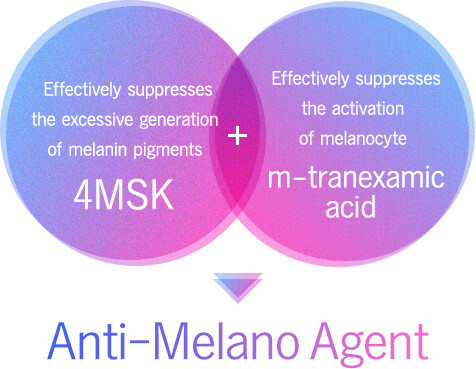 The highly penetrant 4MSK *1 enfolds m-tranexamic acid *2 that penetrates slowly, delivering themselves deep inside the skin. After cleansing, dispense an almond-size amount onto your fingertips. Apply and massage it over your face. The wiping motion exfoliates the horny layer that contains melanin, while at the same time hydrating the skin to create silky skin. After cleansing your face, dispense the product onto cotton wool and wipe the entire face by massaging it into the skin in a circular motion. 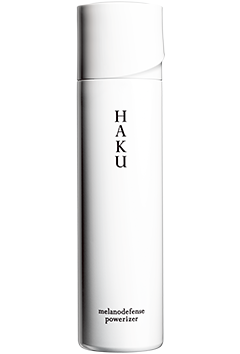 Its hydrating effect supports the regeneration of the skin. Massage it into the skin in a circular motion. After preparing your skin with face lotion, dispense the product onto cotton wool and massage it thoroughly into the skin in a circular motion. Luxurious bubbles that deliver a new texture. 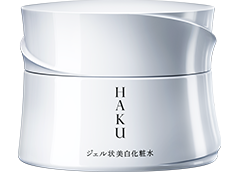 Its hydrating effect supports the regeneration of the skin. After preparing your skin with face lotion, dispense the product onto the palm of your hand (in an amount equivalent to the size of a large cherry) and apply it to both cheeks. Using your fingertips, gently tap the area to burst the bubbles before massaging it into the rest of the face. ・Prepare skin with face lotion before using. 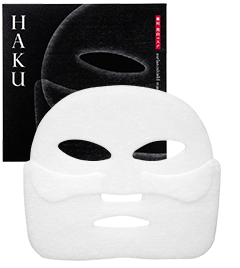 ・Open the package with dry hands and take out one mask at a time. First apply mask 1 (upper), then apply mask 2 (lower). Take out mask 1 (upper) and unfold it. Position the holes around the eyes before spreading the mask over the forehead. Let the mask adhere to the skin, paying particular attention to the sides of the nose. After approximately 10 minutes, remove the mask and smooth in the remaining beauty serum.